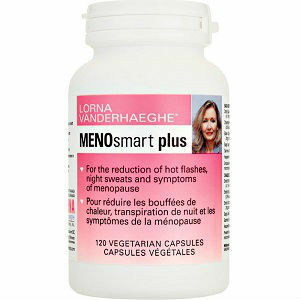 MENOsmart Plus helps reduce the symptoms of menopause like hot flashes, night sweats, irritability, and nervousness. It reduces the atrophy of vaginal muscles and vaginal dryness. It also enhances mood, decreases cramping in legs and provides relief from sleeplessness. It is also a useful supplement for those trying to stop using synthetic hormones or oral/patch estrogen without facing side effects. Black Cohosh extract (Cimicifuga racemosa): Standard hormone therapy replacement ingredient. Relieves menopausal symptoms like hot flashes, sweating, depression, sleep disturbances, vaginal atrophy and dryness, irritability and loss of concentration. Sage leaf (Salvia officinalis): Treatment for excessive perspiration, hot flashes and night sweats. Dong Quai extract (Angelica sinensis): Effective for curbing menopause symptoms and also for regulating irregular of painful menstrual cycles in non-menopausal women. Chasteberry extract (Vitex agnus-castus): Stimulates the pituitary to produce a hormone, which increases progesterone. Also inhibits prolactin, which tends to increase at menopause. Gamma-oryzanol (from rice bran oil): Increases endorphin production and improves mood. Lowers triglycerides and cholesterol and keeps the heart healthy. Also helps keep hot flashes in check. Hesperidin (Citrus sinensis, pericarp): A flavonoid that reduces leg cramps and hot flashes. It also keeps cardiac system healthy. The recommended daily dosage is 4 capsules – 2 with breakfast and 2 with dinner. Does not contain dairy, soy or gluten extracts and is safe for people with allergies. A one-month supply costs $32.99 and comes with a 6% discount, lowering the effective cost to $30.99. The product does not come with any guarantee and there is no money-back policy offered in case you are not satisfied with it. Compared to other menopause supplements available in the market, MENOsmart Plus is quite expensive. This does not have separate day and night time variants and also does not come with a refund policy. While MENOsmart may be a good product, its high price and lack of assurance by the company make it a risky choice. Jackie Horowitz	reviewed MENOsmart Plus	on August 26th	 and gave it a rating of 2.